Time of flight optical sensors determine displacement and distance by measuring the time it takes light to travel from the instrument to a target and back. The technology is used in most radar, laser, and active acoustic devices. These position sensors use either lasers or LEDs as light sources. Lasers are used for very long-range distance measurements (up to many miles). The lasers in time of flight optical sensors are designated as safety class I, II or III devices. Light emitting diodes (LEDs) are less powerful than lasers and have a shorter effective distance. Because LEDs are relatively weak sources of light, however, they do not have safety classifications and can be used in different applications. Selecting time of flight optical sensors requires an understanding of measurement methods. Single trip or a pulse of light- Time of flight laser rangefinders can use pulsed laser beams, which emit very brief, very intense pulses of light. The amount of time the pulse takes to reach the target and return is measured and converted to a distance measurement. Continuous wave- Time of flight sensors can calculate the measured range over a number of trips. The device sends out modulated light and measures its reflections on the target. Within each pixel, the reflected signal is mixed with the originating signal to obtain the phase shift. This shift is translated into a measurement of the distance between the device and the target. The advantage of continuous wave systems is the ability to measure the direction and velocity of a moving target in addition to its range. There are several important specifications to consider when selecting a time of flight optical sensor. Visible or invisible light beams- a visible beam can make the sensors easy to mount and aim at a target. However, a visible beam may be undesirable such as in a factory or processing center where a number of people are working. A visible beam may be distracting and lead to accidents. In such applications, times of flight optical sensors with invisible light beams are desirable or preferable. Measuring range- the range over which the linear output is needed. Accuracy- indicates how close the device's measurements are to actual values . 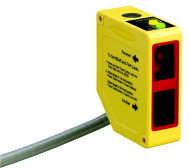 Range resolution- is the smallest change in distance that a position sensor can detect. Sampling rate- how frequently the device senses. It is measured in hertz (Hz). Time of flight optical sensors are used in automotive applications (active pedestrian safety, precrash detection and indoor applications like out-of-position (OOP) detection), human-machine interface, gaming, measurement, machine vision, and robotics.